Thirdway Interiors who specialise in the design and build of offices and commercial premises, were appointed by Schueco London to carry out a complete refurbishment of its new headquarters and showroom at Great Portland Street. The design concept needed to reflect the quality brand of the leading innovative window, door and façade experts, and promote a sleek elegant style. The new Schueco premises at Great Portland Street consisted of two floors – basement and ground. Thirdway Interiors were challenged with transforming the interior, which was in a very poor condition, into a multi-functional workspace. The given space had to accommodate offices, a spacious showroom with meeting rooms and a further display area with conference facilities. With a multitude of functions being spread out over the different levels a universal design was required to create an accessible environment. 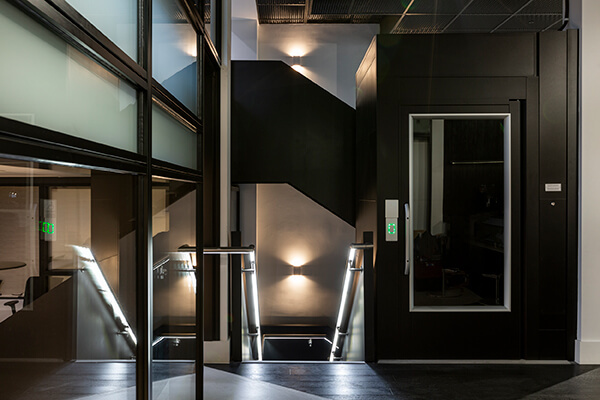 Thirdway Interiors design team contacted the Platform Lift Company to provide a bespoke access solution which would blend in harmoniously with the appearance of the new Schueco premises. 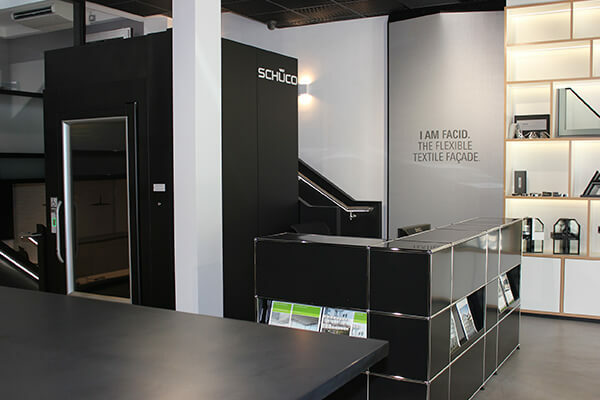 It was important that the materials used for the platform lift matched the monochromatic colour pallet which had been selected as a simple backdrop to showcase Schueco’s own products. The Platform Lift Company recommended its Swedish type lift for ease of installation and design options. Opting for this Swedish style platform lift meant Thirdways could achieve three meters of travel between the ground floor and basement. In addition, the standard steel and stainless steel panels finished in a non-standard RAL colour would blend in with the given design brief. Using its in-house design capabilities, the Platform Lift Company created a stylish platform lift which met all the requirements in terms of design, style and functionality. This was achieved by using a black finish with a silver trim for the platform lift and creating two-metre-high steel shaft panels for a seamless effect. The bespoke platform lift was manufactured to fit the layout and was installed over a four-day period. The complete refurbishment carried out by Thirdway Interiors, which also included a new staircase, floor finishes and the installation of mechanical and electrical services, has now been completed and the Schueco premises have been officially opened. Thirdway Interiors are delighted with the end results which reflect the quality brand and create an inclusive environment by successfully uniting space through the addition of a platform lift. "The new lift has perfectly fitted within the sleek and monochrome look of the showroom. The matt black finish allows it to blend into its environment and the glass fronted entrance looks clean and modern - a great match for this scheme" says Martyna Skoczek, Technical Design Manager of Thirdway Interiors.